Why IT Managers will love the IP Server 900 business phone system | Telco Ltd.
It’s IP-centric. ESI has a wealth of IP experience; they were one of the first entrants into the IP phone system space, and have refined their IP offering over several successive generations. Leveraging its IP experience, ESI designed the IP Server 900 from the ground up to be IP-centric and IT-friendly. Full IP support. 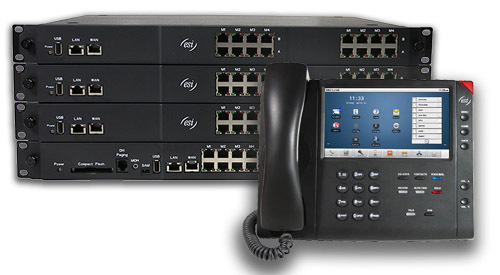 The IP Server 900 supports a full range of VOIP solutions, from SIP Trunking (IP dialtone), to ESI-Link (seamless site-to-site IP connectivity), to compatibility with a wealth of IP endpoints, whether it’s ESI’s proprietary IP desk phones, softphones, cordless IP phones, IP doorphones/RFID readers, or third-party SIP phones (with support for models featuring video and high-definition audio). Broswer-based administration. 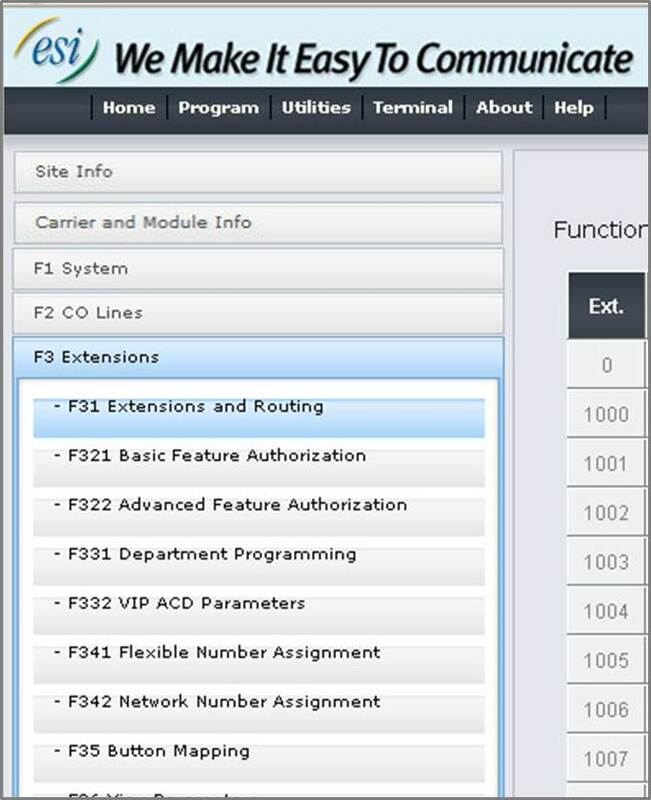 Password-protected programming and administration can be performed from any standard web browser; no software installation required (for convenience, password-protected programming can also be done via an ESI phone). Paperless phones. 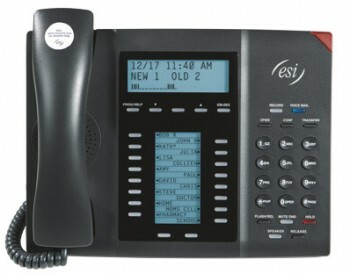 The ESI 60 Business Phone and ESI-250 Smartphone for the Desktop use paperless (“Desi-less”) labeling. Say goodbye to whiteout and/or reprinting templates with these phones! Phone auto-provisioning. Plug in an ESI IP phone anywhere on the LAN for the first time, and the phone will ask you for your admin password and the phone extension number. That’s it! Remote IP phone routerless configuration. ESI Remote IP phone operation does not require any router configuration at the remote end. Router configuration is done once at the main site at initial system setup. Easy software/firmware upgrades. System software upgrades can be performed locally or remotely by uploading a single file. This includes phone firmware, which is automatically pushed out to all ESI IP phones as needed–even to remote (off-site) IP phones! Easy backups. Back up the system configuration over the LAN or WAN. The physical data storage medium is also accessible without opening up the cabinet. Small server footprint. The IP Server 900 Master Control Unit (MCU) is a 1U, rack-mounted device. It supports up to 128 Universal IP ports for ESI phones, SIP phones, softphones, IP doorphone/RFID readers, SIP trunks, or ESI-Link channels (to connect multiple ESI phone systems together seamlessly over the WAN). In addition, it features 8 expansion module slots for analog CO lines, T1/PRI lines, analog stations (such as fax machines, credit card machines, and standard analog cordless phones), and legacy digital (non-IP) phones. If your business needs something bigger, up to three 1U expansion units can be added to allow the system to quadruple in size. More capabilities do not require more space. The IP Server 900 MCU includes several capabilities that many other phone systems require additional rack space to support. Examples of this include automatic call recording (call logging), video recording, full voice mail/auto attendant system, dial-in (“meet me”) conference bridging, building security access support, Mobile Messaging (voice mail to email), Fax To Email, and support for multiple types of non-IP lines/devices. Built for reliability. The IP Server 900 uses the latest Flash memory technology and has no moving parts, for maximum reliability. Low power draw. 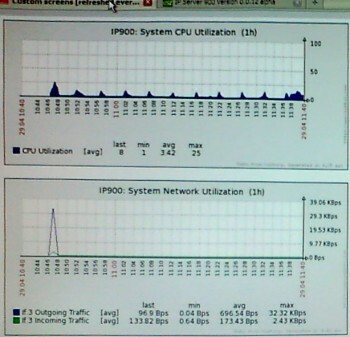 The IP Server 900 MCU, when fully loaded, sips about 50 watts of power. Not only is this good for the environment and will result in a lower electricity bill, but it means that you will get much longer runtime for a given UPS (Uninterruptible Power Supply) in the event of a utility power failure. In addition, the heat output of the IP Server 900 is almost nonexistent. 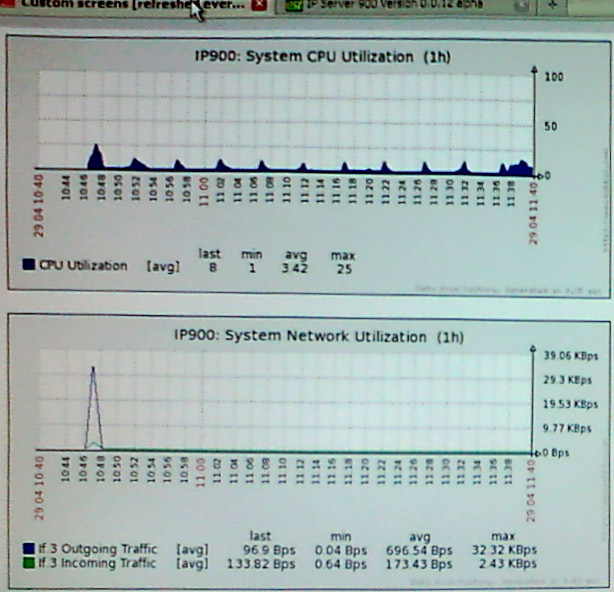 SNMP monitoring. The IP Server 900 supports SNMP, or Simple Network Message Protocol. This is an Internet-standard protocol for managing and monitoring devices on IP networks. This makes it easy to monitor the IP Server 900 along with your other (SNMP-compatible) servers, routers, managed switches, etc. You can use your favorite SNMP network management product, including HP OpenView, OpenNMS, Zabbix, Cacti, and Nagios. Full high-load support. Something that’s kind of “swept under the rug” with most IP phone systems is that there is a difference between total capacity and simultaneous capacity. We have run across many businesses that have purchased an IP phone system that “supports” hundreds of IP phones, only to discover that they can only use a certain number of those phones simultaneously due to processor limitations. After a point, the system becomes overloaded and call quality drops precipitously, or calls get disconnected. Choice of audio codec can lower the simultaneous capacity further. Conferencing and voice mail are two things that tend to have an additional negative effect. This has a direct impact on the system administrator, because this will manifest itself with users complaining that their phones are “broken”, creating all kinds of headaches for the IT department that they may not even have the power to resolve. With ESI, the total capacity equals the simultaneous capacity. All ESI phone systems are engineered to be fully utilized up to the stated capacities. API (Application Programming Interface). ESI has indicated that they will release an API for the IP Server 900, which will allow for interoperability with a wide range of third-party offerings such as Salesforce™. More details will be provided as we obtain them.